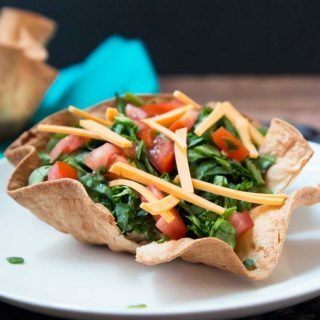 These Layered Taco Salad using Baked Tortilla Bowls are fun to make, work extremely well when catering for a larger crowd, are customizable, and easy to prepare! Mold the flour (or corn) tortillas into the non-stick taco salad molds. Be sure the tortilla is at room temperature to avoid breaking while molding. Bake for about 15 minutes until crispy. Let them cool, and remove from the pan. They should hold shape. Repeat depending on how many molds you have. In the meantime, continue to roast the veggies and prep the rest of the ingredients. For stove-top - Heat some cooking oil in a non-stick pan. Fry the thinly sliced onions, red bell peppers, and green bell peppers on medium-high heat until they are cooked and start charring. Add some salt to taste. Set aside. For Oven - Preheat oven to 450 degrees. Toss the onions and bell peppers in some cooking oil, sprinkle with salt,, and spread in a single layer on a parchment lined baking sheet. Bake in oven for 20 minutes, mixing half way through, until they are fully roasted and slightly charred. Once all your layers are prepped, start to fill each baked tortilla bowl to preference. Layer the bottom with warm prepared beans, top with roasted veggies, chopped greens, tomatoes, and vegan shredded cheese. Sprinkle on green onions, cilantro, jalapenos, and/or diced avocado (or guacamole). Top with your favorite salsa and some sour cream and enjoy! The only way I've made the Baked Tortilla Bowls is with these awesome non-stick taco salad molds. I've seen them at stores like Ross, Home Goods, and Amazon. If you don't have them, you can just as easily enjoy these in taco or toastada form. For the Beans - You can make two of my favorite bean recipes (10-Minute Mexican Black Beans or Fire-Roasted Tomato Black Beans with Spinach & Corn) or simply open up a can of your favorite beans and throw in frozen spinach or corn for some added veggies. For the Vegan Cheese - I love and use Follow Your Heart brand American, Pepper Jack, or Provolone Slices and shred them thin using a knife. Make-Ahead Tip - You can easily make a bunch of Baked Tortilla Bowls ahead of time and store them in an airtight container until ready to use. All the other ingredients can also be prepped ahead of time (i.e. roasted veggies).